Sharp looking lightweight jacked. Got it as a gift but it unfortunately fits more like a large. Waterproof shell. (see photos). make Supersized seem small. Great Quality! Great gift idea! This jacket is in very good condition with no holes and just normal wear from use and a couple light marks. the interior is clean. For sale is a Bobby Clarke orange Philadelphia Flyers 1974-75 style warm-up jacket by Mitchell & Ness. Jacket has Clarke's # 16 on the top front right. Unique jacket that is great for any Flyers fan. All colors are bright and vibrant. Show your love for the Philadelphia Flyers by wearing this authentic 1980s NHL Starter shiny satin jacket! Flyers Patches on front and back, NHL patch on left shoulder, and Starter patch on left sleeve cuff. Flyers Symbol on the left breast, and FLYERS is spelled out across the upper back of jacket. Machine Washable. Jacket Length: 29.5". Sleeve Length: 28.5". Left Arm has a vent zipper. There is a right breast pocket, along with two front pockets all with zippers. IN GREAT CONDITION EXCEPT FOR SMALL NICK IN BACK, SEE PICS. NEW ONES GO FOR OVER 100.00. 100% acrylic. Very nice quality scarf. Good condition overall with light wear. Leather look but it is polyurethane. This is an 100% Authentic pre-owned high Quality Philadelphia Flyers Reebok NHL Face Off Collection Hockey Zip Up Hooded Jacket. Shirt is in excellent condition. Type: Reebok Face Off Collection. Arm Length: "20. Vtg Reebok Center Ice Collection CCM Philadelphia Flyers hockey mens pullover half zip jacket...kangaroo front pocket, ripcord waist with side zipper for easy on and off...black with orange...sewn Flyers logo, NHL logo, with Flyers on sleeve....great condition, very gently worn...lined...size Large...free shipping! Everything is embroidered, the jacket has 2 side pockets & the nylon is thicker than most windbreakers, making it more water resistant. PHOTO COLORING: May vary from actual product. Top Of The Shoulder To Bottom Hem: 29". PHILADELPHIA FLYERS. MADE BY: PRO PLAYER. TYPE: ADULT. LIGHTWEIGHT JACKET. SIZE: LARGE. This jacket has been worn , but is in good condition. From a smoke free home. FABRIC: 100% NYLON. I've got nothing to hide. THIS JACKET IS PREOWNED AND HAS BEEN WORN PRE-OWNED - EXCELLENT CONDITION (SEE PICTURES). Authenticity & Condition. Not your size or style?. UP FOR SALE IS A NHL PHILADELPHIA FLYERS JACKET WITH MATCHING FITTED HAT, BOTH FROM MITCHELL AND NESS. 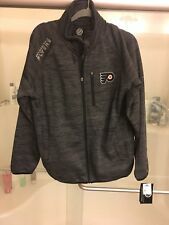 Mens 2XL Philadelphia FLYERS NHL Majestic Therma Base Authentic Premier Jacket. Condition is Used, like new. Shipped with USPS Priority Mail. Size large. Great condition. Perfect for the fall season. PHILADELPHIA FLYERS ZIP UP WOOL COAT , WITH THE FLYERS EMBLEM ON LEFT SIDE OF CHEST , AND HAS TWO BUTTONS AT BOTTOM AND ONE AT TOP TO SECURE FLAP OVER ZIPPER FOR NICER LOOK !! " PROFESSIONALLY CLEAN "